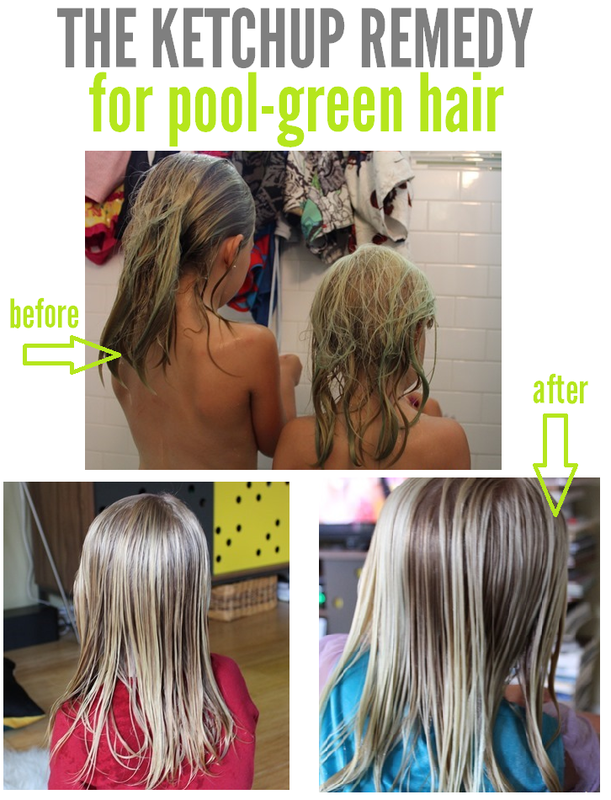 Restoring “chlorine green” pool hair to blonde with ketchup. Yes, ketchup. We joined a pool for the summer (thank you, Groupon!) and spent about half our summer days in that water. It was a lovely place, with one exception: the water totally turned my girls’ hair green. Day by day, it was getting more and more neon. As cute as the ombre green look was, I wanted to get it out before they went back to school. I did some research and was recommended some very pricey shampoos, but the one thing I kept hearing about was ketchup. Apparently the green in the hair is neutralized by the acid in ketchup. Or something science-y. I don’t know. Someone on the internet said it, so I tried it. Actually, that’s not entirely true. First I tried tomato sauce. Because we didn’t have a ton of ketchup. But the tomato sauce was really runny and ended up making my bathroom look like a crime scene. And the smell was making the girls gag and cry. So then we went with the ketchup. I applied it to their hair and then bagged it up with a clip. Then we watched a movie, with the ketchup doing it’s magical science-y things. After about a half an hour, we rinsed it out and shampooed as usual. And voila! No more green hair.